Prime Minister Ahmet Davutoğlu recently unveiled his party's "New Turkey Contract." Turkey is not the only country in the world where Islamist Machiavellism features excessive doses of deception and perception management in the name of "dawa": The holy cause, or advancement of Islam as a political - and therefore social - ideology. Whether or not, in Turkey's case, the cheaters can be blamed for cheating has many different answers, depending on which perspective they are judged from: Moral, political, pragmatic, humane or just based on reality. They market an indecent product and it sells. Ahmet Davutoğlu the human being may be annoyed by having to resort to not-so-decent techniques to market that indecent product, but Ahmet Davutoğlu the prime minister feels inevitably compelled to play his part and market the same product in the name of "dawa." His election manifesto 2015, or the "New Turkey Contract," is not worthy of any deep analytical thinking. No election manifesto would promise a nation torture, authoritarianism, systematic corruption, undemocratic practice, poverty or cheating. Prime Minister Davutoğlu's (not to be confused with Mr. Davutoğlu) election manifesto is no more than a compulsory text of fairy tales that he knows will never come close to reality. [Complains of concepts like] national sovereignty, national security, national interests and national culture… (The word "national" remains a taboo in the House of the AKP). The party promises to fully establish freedom of expression. It aims to safeguard all political and civilian freedoms and to make sure people live without fear and worries. (This has been partly realized. AKP members and supporters live without fear and worry). [Promises] a state concept based on human rights. (Also partly realized. There is an impressive shield of state safeguarding for human rights for AKP members and supporters). Universities will transform into a forum where every opinion can be taught and debated in a democratic and tolerant sphere, and where there are no bans or restrictions. (Not bad. Could challenge the previous entry). Stopping violence against women is a priority policy. (Policy goal achieved. Apart from the fact that 281 women were murdered in Turkey in 2014, a 31 percent increase on the previous year). The party promises to keep the country's interests above the party's interests. (Revisit the title of this article). Our country will become a state of law and win a respected place in the international community. (Your columnist had to stop typing here due to a laughter spasm). Our goal is to create a society of peace where there is no place for fear. (Another break, please). 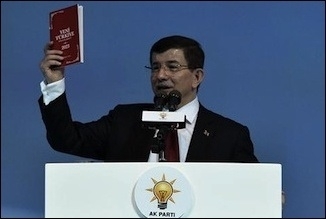 In all likelihood, another columnist will have to revisit Prime Minister Davutoğlu's 2015 election manifesto in 2028. Most probably they will have to have regular typing breaks due to laughter spasms. Despite everything, Turkey is fun!